For fans of Jerry Lewis¡ªand no, they don¡¯t all live in France¡ªFebruary 22, 2009, is a big occasion, the night he¡¯ll accept a long overdue Jean Hersholt Humanitarian Award at the Oscars. For cinephiles, November 22, 2008, was an unforgettable evening as well. 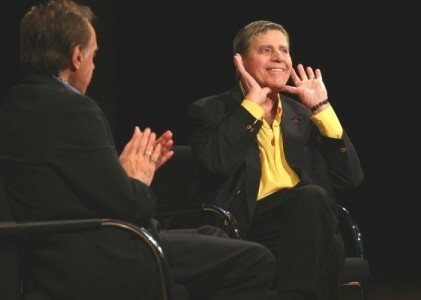 Jerry Lewis was interviewed onstage by Peter Bogdanovich at a Museum of the Moving Image event, "The King of Comedy." As the title indicates, it was not an evening for false modesty (or for humanitarian behavior for that matter, as evidenced by Jerry¡¯s humorously pointed treatment of some of his interviewer¡¯s questions). The 82-year-old performer, director, and writer talked candidly and unabashedly about his remarkable career. Far from a rehash of old anecdotes, the evening was a riveting piece of live theater, with Jerry¡¯s commanding personality, crisp timing, and razor-sharp wit on full display. Bogdanovich, a renaissance man himself who has interviewed and written about such great directors as Howard Hawks, Alfred Hitchcock, and John Ford, on his way toward becoming a major director in his own right, has been a friend and admirer of Jerry Lewis for 45 years. He was a gracious host who found himself in the role of comic foil, steering the conversation from Lewis¡¯s partnership with Dean Martin to his general approach to comedy, to his evolution as a film director. The program was the perfect coda to an event that took place 20 years earlier; in 1988, Lewis was the subject of the Museum¡¯s very first retrospective. At the time, he was busy in Vancouver with the filming of his guest appearance in the TV series Wiseguy. It took 20 years to arrange this program, and it was well worth the wait. An excerpt from the conversation follows. ¡ªD.S. To listen to the entire conversation between Jerry Lewis and Peter Bogdanovich, visit เครดิต ฟรี 500 ถอน ได้Pinewood Dialogues Online. Right. And that's why they wanted to see me in New York, and I knew that I had made what I thought was a great family package. We went right to the recordings and all of the graphics and the artists' work that I had, and Walter Scharf's score, and I had a date at Christmas time for families to see it, and Barney Balaban says to me, in his office, he said, "Jer, we gotta have a Jerry movie in the summer." And I said, "Well, Barney, I made this film with families in mind for Christmas," and he said, "Well, geez, you gotta let me take it for the summer," and I said, "Don't. I'll give you a movie for the summer, OK?" He said, "What are you talking about?" I said, "Look at the date"¡ªon his calendar on the desk. I said, "It's January 3rd. I'll give you a movie for the summer, which means I have to deliver it May 30th." That meant I had to finish it, score it, edit, do it all. And he's looking at me like I'm insane; he said, "Are you telling me you are really going to commit to this?" I said, "I'll give you my handshake on it." My whole deal with Paramount was a handshake, never had a contract. I said, "Barney, got a handshake." I went down to Florida that night, leaving him, and I had opened the next night at the Fontainebleau. And I then proceeded to write The Bellboy. That night I did two shows and went to my suite and started to write. And in nine days I had 160 pages, OK? I had a crew sent from Hollywood, I put everything together locally, and I was shooting 27 days after I said to Barney, "You're gonna have it." The video assist is a closed-circuit monitor that enables you to see while you're shooting¡ªit enables you to see what you're shooting on a TV monitor. Jerry invented that and for years was the only person using it. Now everybody in the industry uses it on every picture. How did you come...how did that happen?